Some people collect spoons or keychains or coffee mugs. 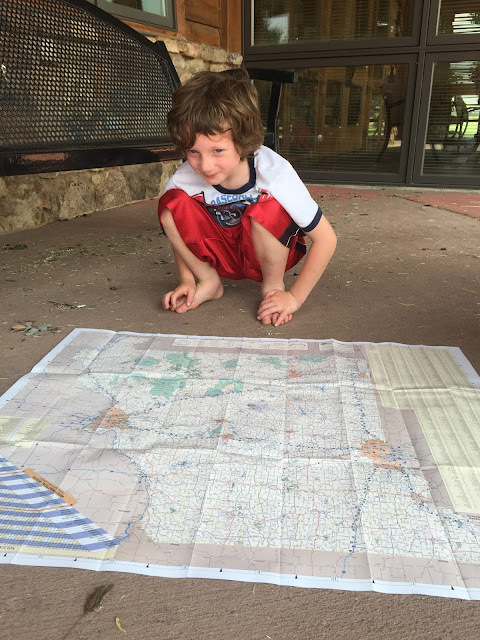 On our road trip last week, Wade collected maps and flyers. He picked up one or two or seven different flyers and maps at every single stop we made. And yeah, he isn't wearing any shoes. I started calling him the Britney Spears of road trips because he loved going barefoot everywhere (and after 1,500 miles on the road, I let him). After being gone for 10 days and making a gajillion stops, he had quite the collection. After throwing quite a bit of it in the recycling, I decided to do something crafty with the maps. So, I headed over to Pinterest for inspiration and found some ideas. 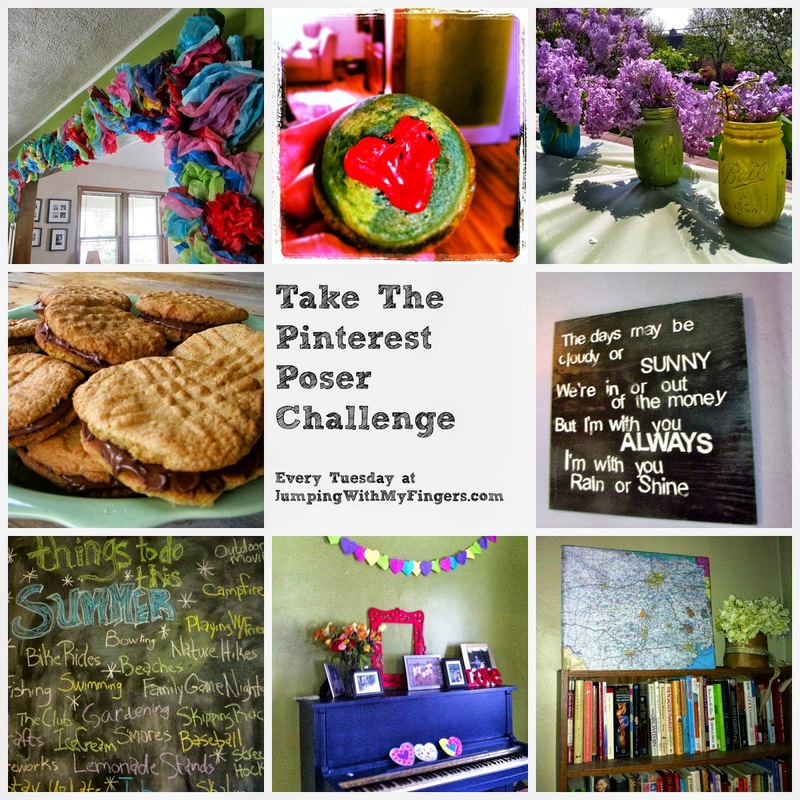 For this week's Pinterest Poser Challenge* I got crafty with maps. This was fun and simple and free. And it's meaningful! Cut out some triangles. I tried to get one from each state we visited and cut out close to some of the cities we visited. I jabbed my scissors into the triangles in two spots, making holes for the ribbon. I found white ribbon (the kind used to wrap gifts) in my craft cabinet and threaded it through the jagged holes in the triangles. Then I duct taped it to the siding on my front porch. Some DIY stuff you see on Pinterest totally overcomplicates stuff in my opinion. Sure I didn't cut straight lines and nothing at all is perfect about this bunting, but I love it. It used maps we got on an awesome road trip full of good memories, it only took about 20 minutes to make and it makes us happy. No need for straight lines or perfection here. We fell in love with Memphis on our road trip. 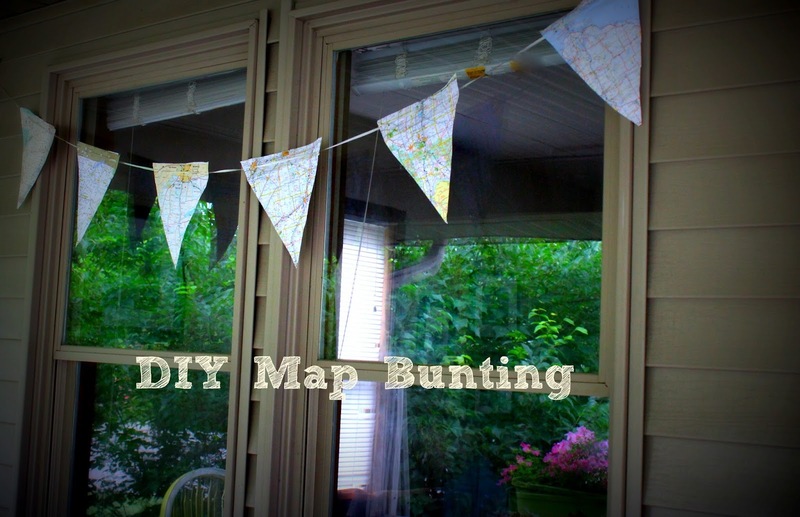 And now I love that we have this map bunting reminding us of our trip and our adventure! I just love these flowers. Because Wade's collection was so vast, even after the DIY bunting I had plenty of map leftover. So, I made a sign with a quote from a Mamas and Papas song. Because of course, right? I actually got the idea from an artist I follow mostly on Instagram. Her name is Amy Turn Sharp and she is fabulous and interesting (click here to go to her web site). For my project, I grabbed a box and cut a square out. Then I cut the map to fit around it. I ModPodged the map onto the box cut out. After it dried I wrote the quote with a Sharpie. How is your summer going so far? Have you gone on a road trip? Have you made anything inspired by Pinterest lately? Let me know in the comments or over on my Facebook page. I love map projects! Christian has a ton of maps, so if I haven't already thrown them out, I'm going to try the quote project!